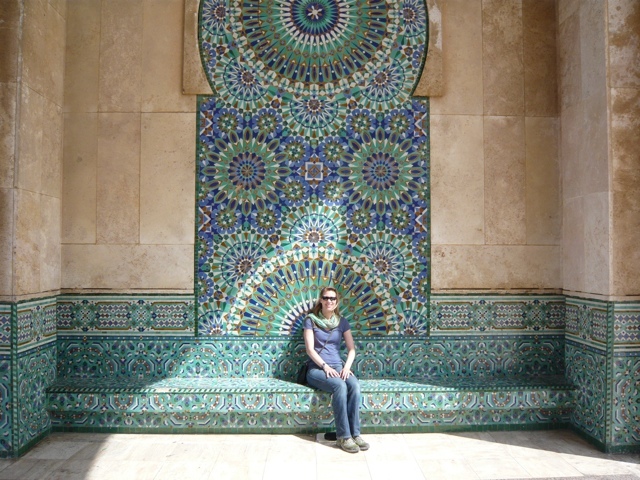 The highlight of my visit to Casablanca (Casa) was by far my visit to the Hassan II Mosque. I met my guide, Anis (pronounced and named after the spice) who again spoke French and had a fabulous one on one tour of the mosque, which is the third largest mosque in the world (after Mecca and Medina). 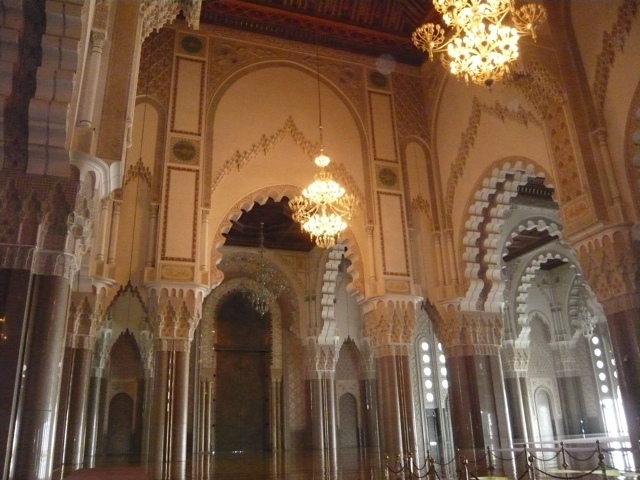 The mosque was built from 1986 to 1993, and required over 10,000 artisans and 12,500 workers to complete the work. They worked day and night, non-stop. 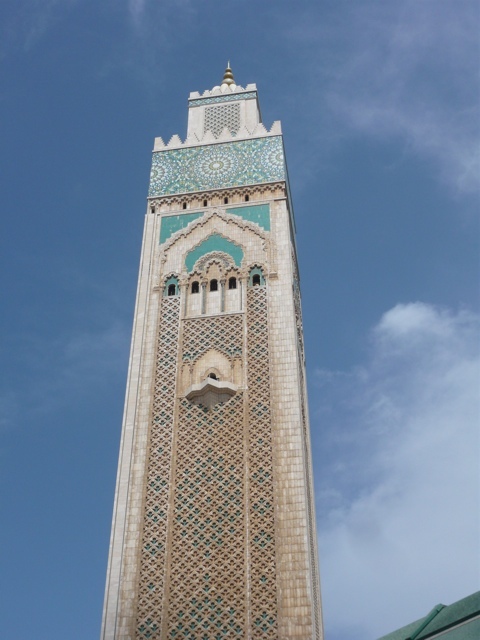 The minaret (the tower) is the largest in the world (200 m above sea level) and is quite impressive. The colors of the mosque symbolize the colors of Islam: Green and White. Green symbolized peace and white represents universalism. The inside of the mosque holds a capacity of 25,000 people and the outside courtyard area holds up to 80,000 people. This is the ONLY mosque in all of Morocco that allows tourists inside (due to ancient French law, not due to religious reasons). 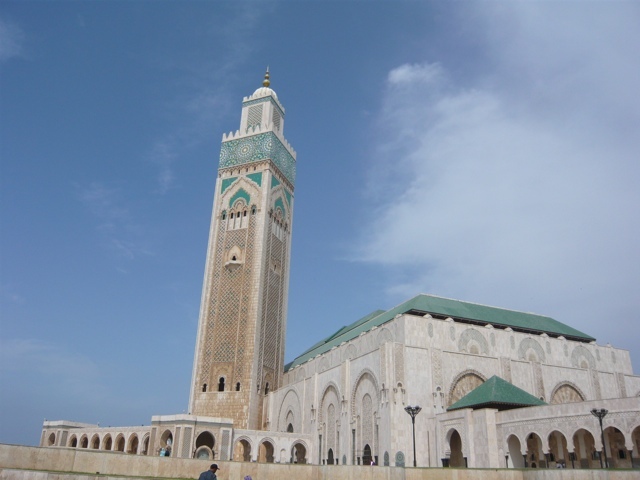 The official religion of the Moroccan kingdom is Islam (Sunite Malekile) and there are about 70% practicing Muslims. In the Islam religion, there are five official daily prayers at: Dawn, Mid-morning, Mid-Afternoon, Sunset and Night. Each day a minute is added to the prayer time to reflect the change in the rising and setting of the sun. 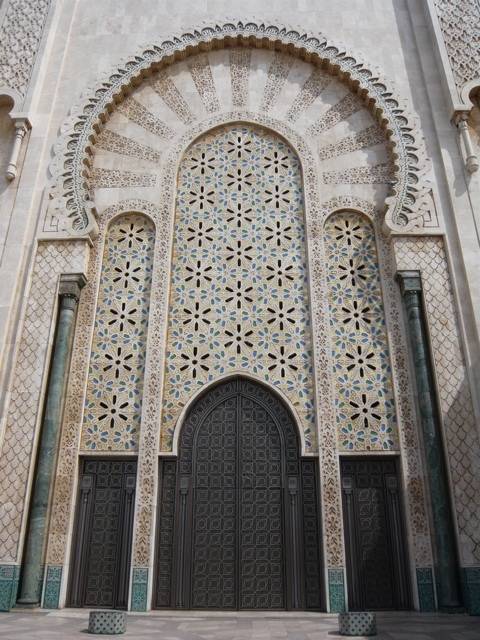 The call of prayer can be heard throughout Morocco and the first time I heard it, I was mesmerized. It is loud and melodic, calling all Muslims to come to prayer. An amazing event to experience! 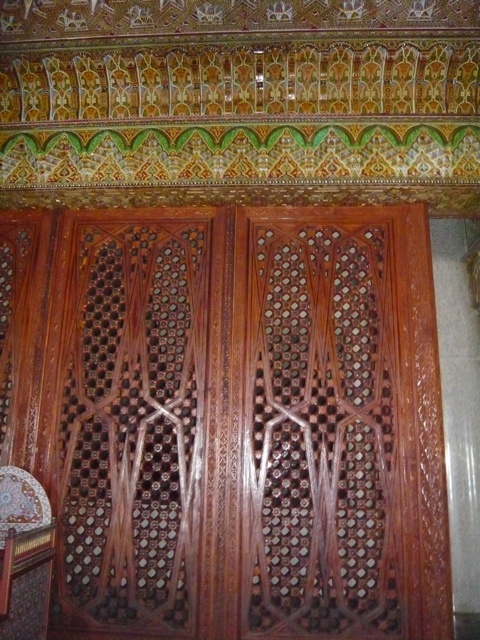 The inside of the mosque is constructed with all Moroccan materials. 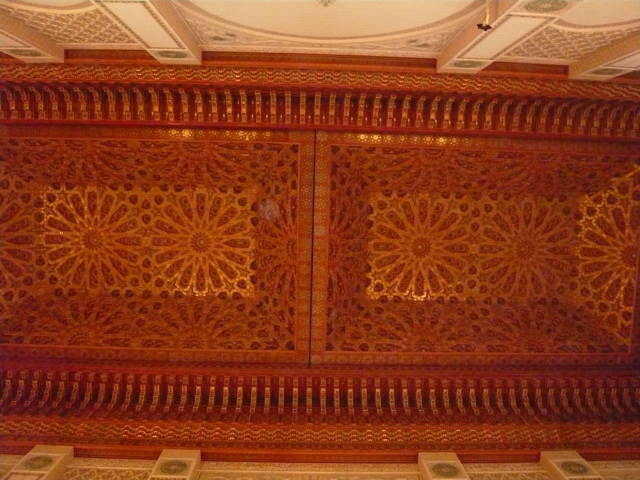 The ceiling is made with Moroccan cedar that is sculptured and then painted in beautiful colors and images. The mosque has three levels. The bottom floor level contains the fountains of water for purification. 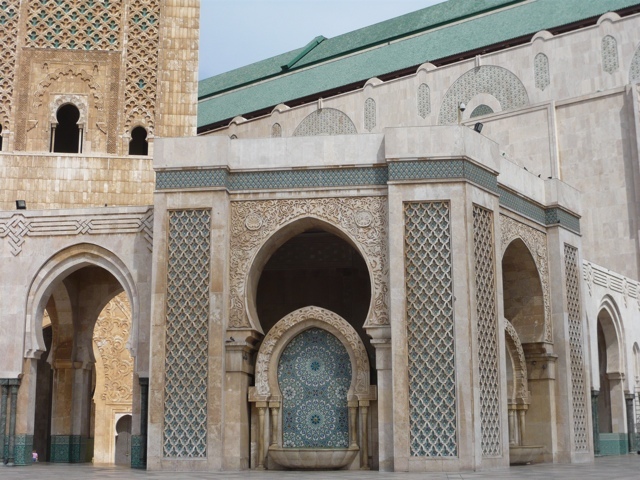 Men and women each have a separate door to enter and separate rooms that contain 41 marble fountains full of water where Muslims wash every external part of their body before they are allowed to enter the mosque. 1. The ceiling completely opens up so you can see and have contact with the sky which is extremely important for Muslims. 2. 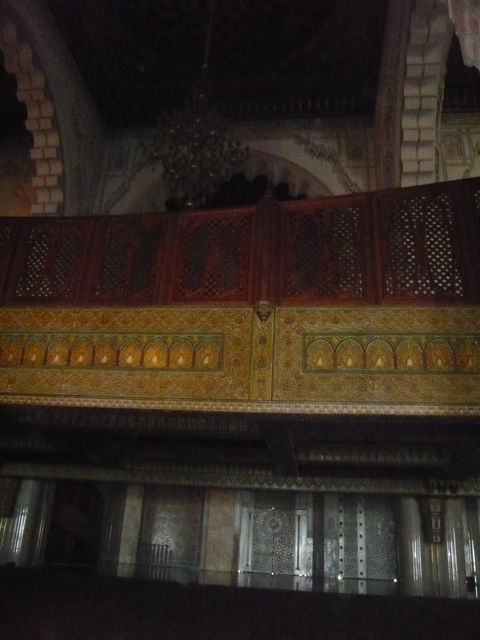 Le Mihrab: Is like the alter in a church where the IMAM (leader of prayer) heads the prayer. It is of course facing Mecca. 3. There are four positions of prayer, called in french, Les genuflections. First, you face Mecca and greet by lowering your head to show humility. Second, you place your hands on your knees. Third, you slightly flex your knees. Fourth, you lay on the ground on your knees with your forehead touching the ground. 4. Muslims only use right hand to greet and eat. Left hand if for doing the “other” dirty stuff involved with being a human (i.e. blowing nose, using bathroom, etc). 5. Muslims are called to prayer five times per day as mentioned above. 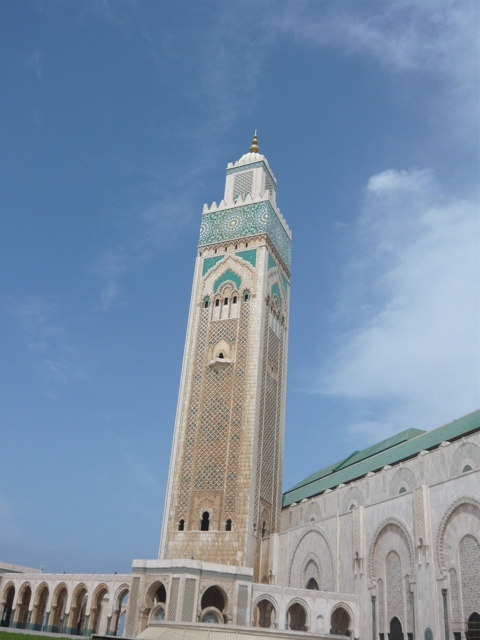 However, Moroccans are the most modern Muslims in the world thus it is not obligatory that you go to the mosque five times a day to pray. 6. There are varying degrees of how religious a person is. Just like in the States. 7. Not all women where the hijab (veil). Many more women are dressing western nowadays. What I discovered is that Islam is a very fascinating religion. Obviously it is a religion that is very misunderstood thus I look forward to sharing what I find. The mosque is both magnificent and beautiful. The details of the carvings are amazing. Nice pictures. Thanks! I’m glad you are enjoying! I hope you and the kids are doing well. Most muslims in Indonesia and Turkey are also very modern and moderate. However small radical groups everywhere in the world have given Islam very bad reputation. Nice post! Interesting post and look forward to more. It looks beautiful. I’d love to take photos there.